Yes, midnight biryani is a thing in Hyderabad, and if you haven’t been to one yet, then you need to get to work buddy. The city’s love for biryani is eternal. Strutting to a restaurant during regular hours only to find it crowded is an anti-climatic episode. So, when’s the best time to devour biryani, you ask? Way beyond the Cinderella hour, we say. And luckily for us, several city hotels and eateries cater to your late night cravings. If what’s keeping you up late in the night is biryani, well, let’s fix it right away. Known for its iconic Mutton Biryani and Pakistani Mutton, Shadab runs full house till 2am daily. Drive through the lanes of the Old City and you’ll find yourself in front of the well-lit and crowded Shadab. Find a table, order biryani and faluda. End your meal with the sheer goodness of qubani ka meetha. Gotta love the weekend specials at Chicha’s because there’s haleem, marag, and paya to be had. Popular for its Khatti Dal, Gurda Fry, and quirky Hyderabadi ambience, Chicha’s will offer you more than just biryani. Arrive with a hefty appetite, order the specials along with a Masala Coke and eat away. If you are not big on ambience, you simply cannot miss Grand’s Hyderabadi biryani. Located on one of the busiest streets of Hyderabad, Grand welcomes you with no fanfare but promises the most aromatic extravaganza of delicacies. Be sure to order their Mutton Boti Kabab and Special Lassi. ‘Eat and go’ ought to be your mantra at Shah Ghouse. Usually crowded and noisy, this restaurant is famous for its mutton biryani. After a long day at work, pack your bag and head over to Shah Ghouse to rejuvenate your spirits in between mouthfuls of biryani. Wrap up the meal with an ice cream or phirni. Alpha is a regular eating spot for travellers as it’s located near the railway station. Although it closes at midnight, you should make a visit before it shuts down to take away their Kheema Roti and Chicken Biryani. And the best part? It doesn’t pinch your pocket at all. Craving more? 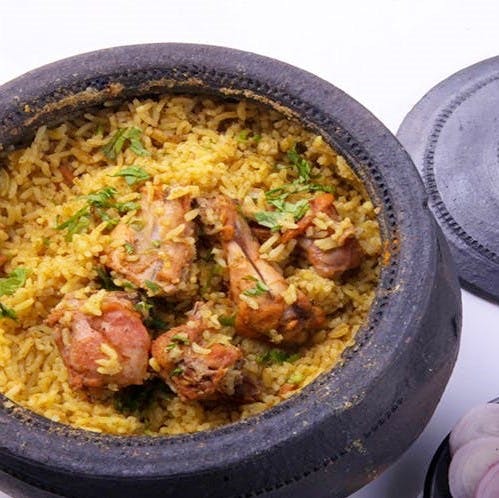 Then you must try the all-you-can-eat Midnight Biryani Buffet at Tulips restaurant at Green Park hotel. Indulge in a laid-back yet luxurious dining affair that can unfold till 2.30am. Pick a Friday and end up here. Eat till your belly bursts. Trust Cafe Bahar for authentic biryani and you shall have it! We love it for the dum biryani and the tandoori chicken, but the mouthwatering kebabs are no less drool-worthy. While here, hop on for an adventure of finding yourself a table. But when you do, thank your stars and gorge your way to glory.